A general problem in compositional data analysis is the unmixing of a composition into a series of pure endmembers. In its most complex version, one does neither know the composition of these endmembers, nor their relative contribution to each observed composition. The problem is particularly cumbersome if the number of endmembers is larger than the number of observed components. This contribution proposes a possible solution of this under-determined problem. 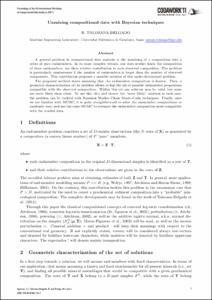 The proposed method starts assuming that the endmember composition is known. Then, a geometric characterization of the problem allows to nd the set of possible endmember proportions compatible with the observed composition. Within this set any solution may be valid, but some are more likely than other. To use this idea and choose the "most likely" solution in each case, the problem can be tackled with Bayesian Markov-Chain Monte-Carlo techniques. Finally, once we are familiar with MCMC, it is quite traightforward to allow the endmember compositions to randomly vary, and use the same MCMC to estimate the endmember composition most compatible with the studied data. Tolosana-Delgado, R. Unmixing compositional data with Bayesian techniques. A: International Workshop on Compositional Data Analysis. "Proceedings of the 4th International Workshop on Compositional Data Analysis (2011)". Sant Feliu de Guíxols: Centre Internacional de Mètodes Numèrics en Enginyeria (CIMNE), 2011, p. 1-5.